Our slim open can has a space-efficient shape designed for tight spaces, while its open lid makes it easy to toss in trash on the go. The sturdy stainless steel construction, lift-off lid, and large capacity make it an ideal choice for for busy, high-traffic areas such as restaurants, coffee shops, and hotel lobbies. ADA-compliant. Designed to make the most of tight spaces. Our code N liners are designed to fit this can perfectly so they don't slip, and they stay completely hidden. Extra-thick plastic and double-seam construction prevent rips and tears. 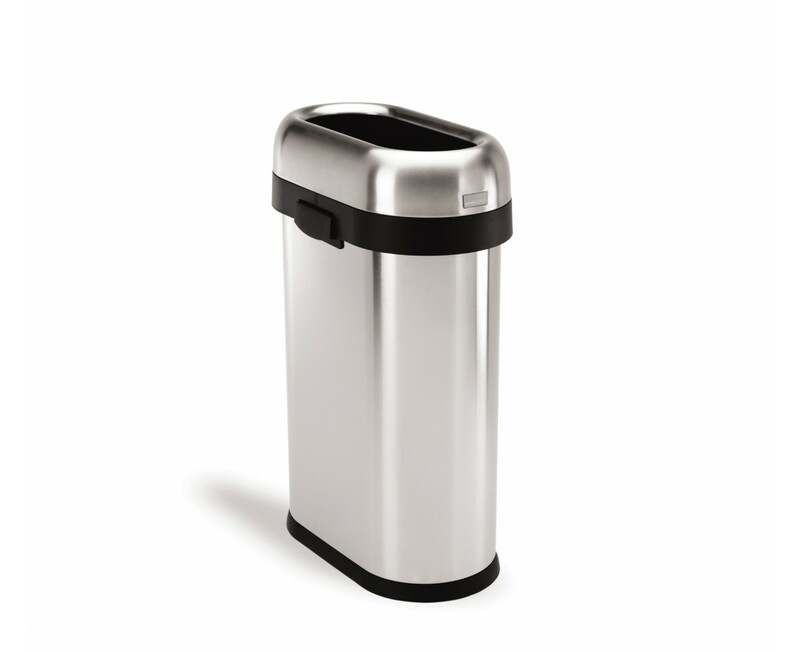 We use this super sleek bin for multiple commercial applications within our organization, from cafes, restaurants, and retail. We have been buying these bins for years and they stand up. I would recommend using a black bag instead of the provided white bag as the contrast can be distracting. Very modern look, the waste basket is used at the bar of a hotel. Stylish and chic for a waste basket. Would recommend to friend and or business and definitely purchase again. This is a well made, good looking trash can. The brushed finish does not show fingerprints, which is important as it is in the kitchen and used constantly. This particular can is quite large, but if you have a good sized kitchen, it looks great and uses any 13 gal. trash bag. The domed top has open access but prevents the garbage from showing. It also hides the top of the bag when the lid is on. Would purchase this brand again and with fast service directly from the company. I use this trash can in my kitchen; the capacity is perfect for trash bag liners to fit, be filled and removed easily. The top discourages nosey pets. It's a quality product and sharp looking. This is just what I've been looking for.I do alot of cooking,baking etc.Going from counter to trash can alot.I was fed up with lids that broke after a short time.Having no lid is great.The design and built of this great.Fits right into my kitchen.Looks great.Very happy with purchase. I love this can. Use it for recyclables. So nice not to deal with a lid when recyclables are all clean and just want an easy way to gather them up! Great shape and size! There isn't anything negative to say about this product. The quality is outstanding and it looks good. We use it everyday for single-stream recycling. Needless to say, it gets a lot of use. Highly recommend. Goes great with my new appliances in my new house. 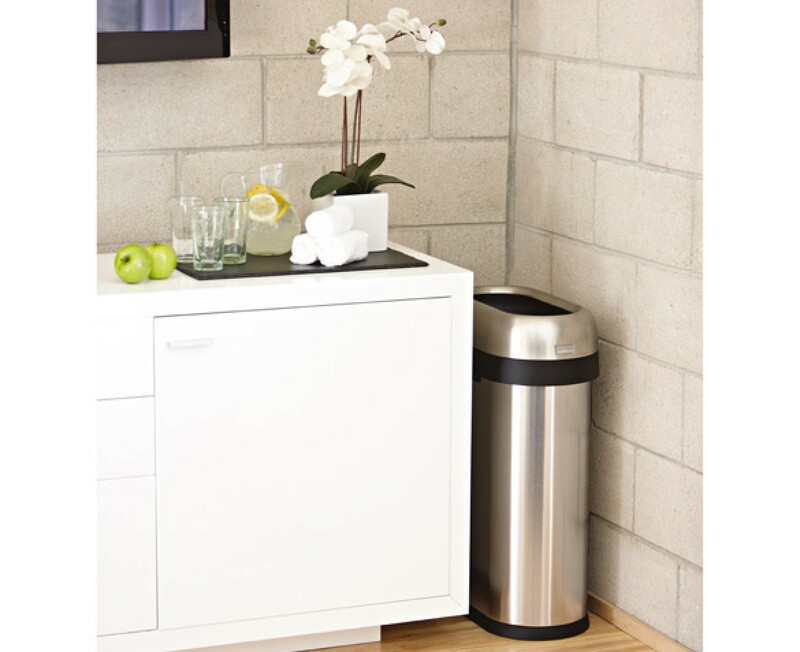 I had been looking for some time to find a trash can as tall and as sleek as this one is. This is the second slim open can that I bought... because I loved the first. I use one for trash and one for recyclables. I like that it is unobtrusive, even though out in the open, and I like that plastic liners do not slip around. It replaced a Simplehuman can that had a lid. The lid finally gave out after many years of service. We decided to get an open can this time since our trash never sits in the can long enough to stink. We love it and it looks great too. The slim design is perfect for our conference rooms. It fits next to the beverage server taking up minimal space. It also looks attractive and the open top minimizes the mess often associated with trash containers.